The first tortoise I ever got a good photo of. Turtles and tortoises are found in the fossil record going back as far as 250+ million years. That’s a very long history in terms of a species’ time in existence on this planet. Obviously, something about the way they are built has allowed them to survive and be molded into many kinds of turtle or tortoise over such a long span of time. 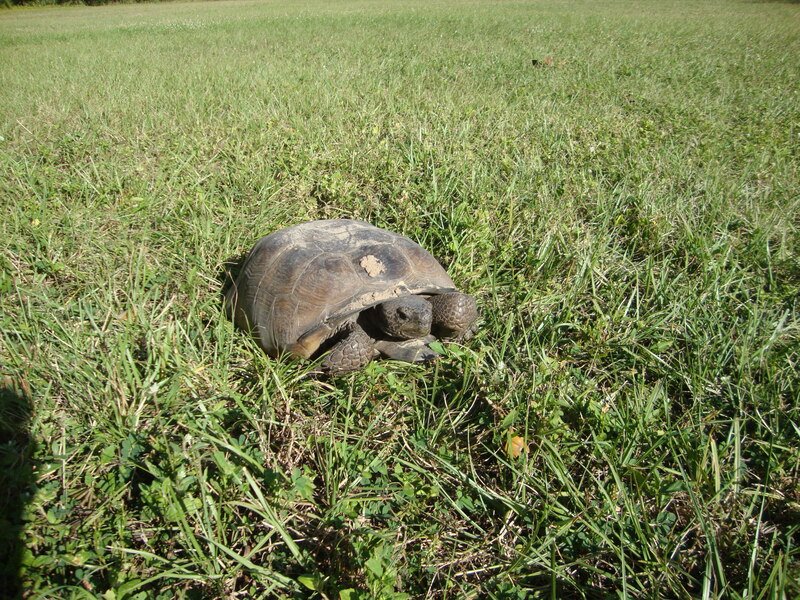 Turtles are often aquatic in nature, with a handful of species being terrestrial, and tortoises are the largest of the land dwellers. Some of which become hulking giants who eat a diet not much different than a horse. 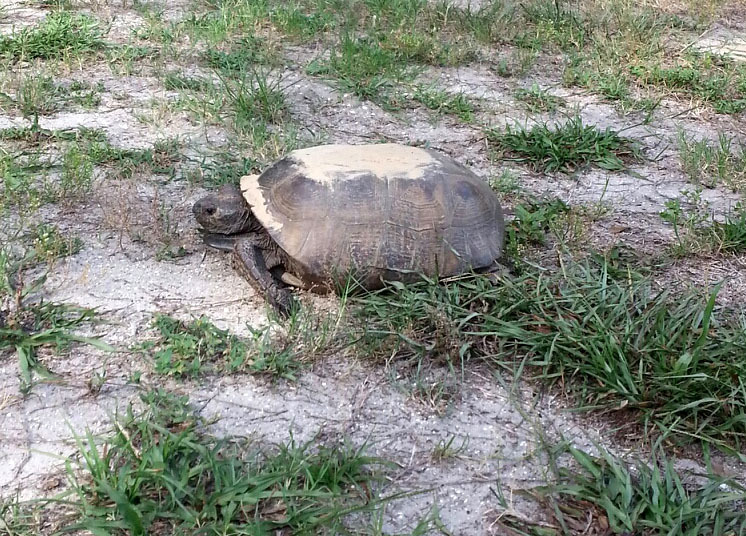 The gopher tortoise (gopherus polyphemus) belongs to a group of land tortoises that originated in North America 60 million years ago, thus making it one of the oldest living species. This species typically grows to about one foot in straight carapace length, and an average weight of 29 pounds. There have been some found to be as big as 16 inches in length. The 2nd individual I got photos of. This one had a slight reddish tint to the shell, along with some sand left from the burrow. 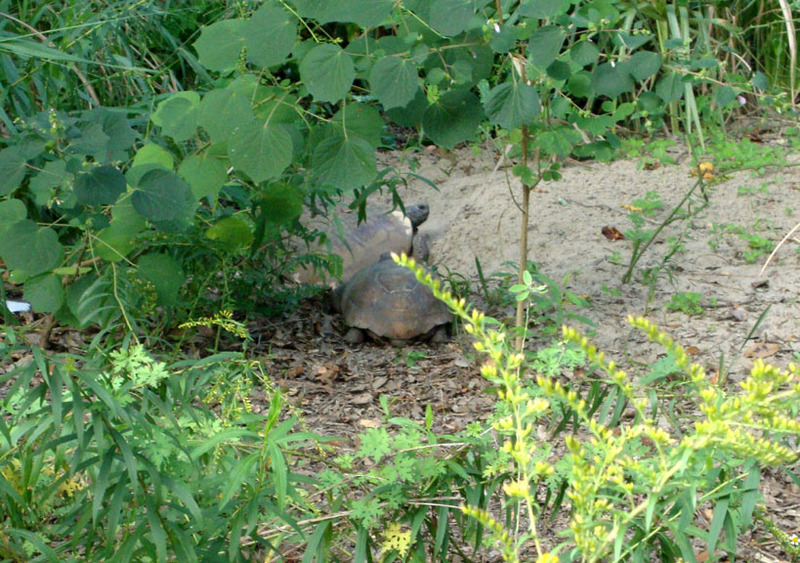 Gopher Tortoises are specifically built for digging and living in burrows, as you can see from the shape of their shell. Their strong front legs aid them in digging burrows that can be up to 50 feet in length underground. 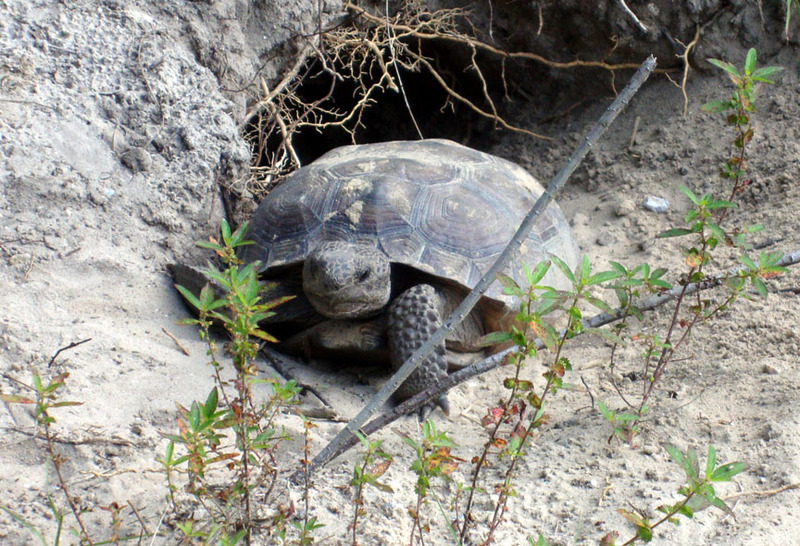 At the end of their burrow lies a larger chamber where the tortoise sleeps or takes shelter. They also immediately bolt to the burrow entrance when they spot danger, and to this day many of them do this to me when I come bearing my camera. 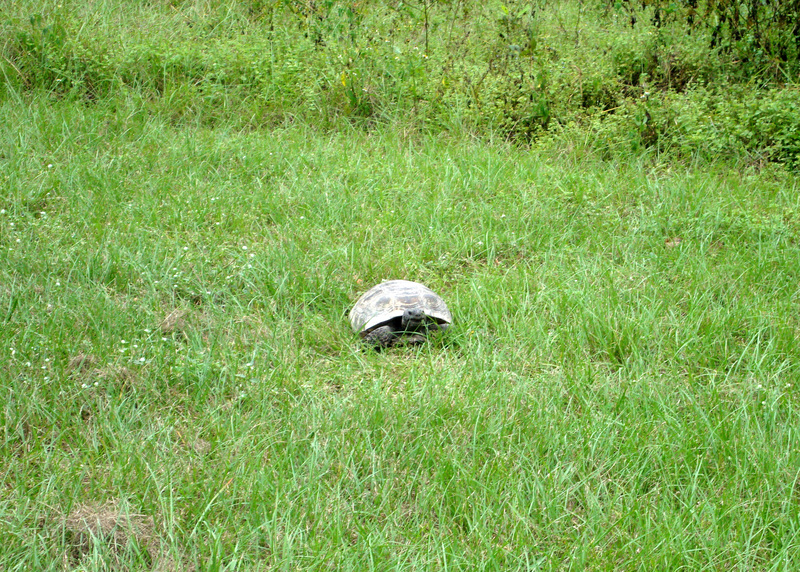 These tortoises are an ecologically important species, consider that many other animals use the burrows as shelter both abandoned and inhabited by tortoises. Other reptiles, small mammals, and amphibians all may use the burrows for shelter during a forest fire, freezing weather, drought, etc., which often saves many lives otherwise. If these tortoises were to disappear, so to do their burrows, which then take away potential shelter for a multitude of species. 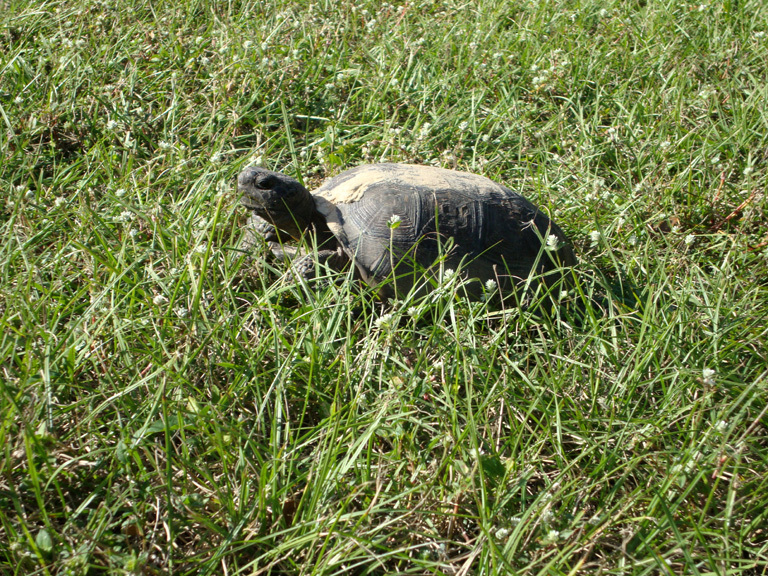 Not only do Gopher Tortoises benefit other animal species, but they also help stimulate new healthy growth in the plants and vegetation they eat. Rarely are they see drinking water, since they get most of the moisture they need from the vegetation they consume. They have only ever been observed drinking standing water during droughts. Another colony member, possibly female because of size. This has to be the largest tortoise I’ve seen. For size comparison, that tree is no more than 5-6 feet away from the individual. Big. Gophers are thought to exceed a lifespan of 60 years, and become sexually mature at 10 to 15 years of age. I can only wonder how old some of the individuals in the colony I visit are. Females are typically larger then males, hence they have to carry the eggs of the species. The males are smaller, with a concavity on the plastron which aids in mating. The colors of this particular tortoise aren’t very vibrant, but still give them earthy-toned charm. Younger tortoises usually have brighter coloring for the first few years, with the hues fading as they gain size and age. Their colors range from dark gray, black, light gray, brown, and a slightly red clay color. A very young individual I’ve seen has blackish skin, with a brown shell with light orange patches on top. 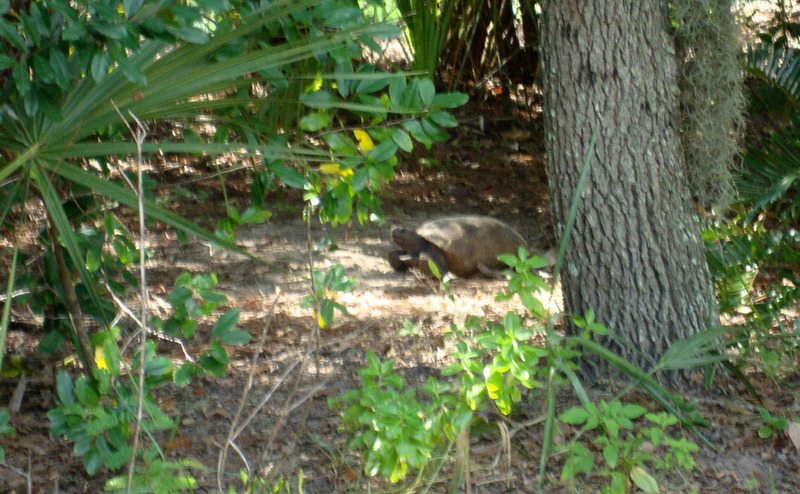 He or she booked it back to the burrow before I could get a good photo. They’re faster than they look. 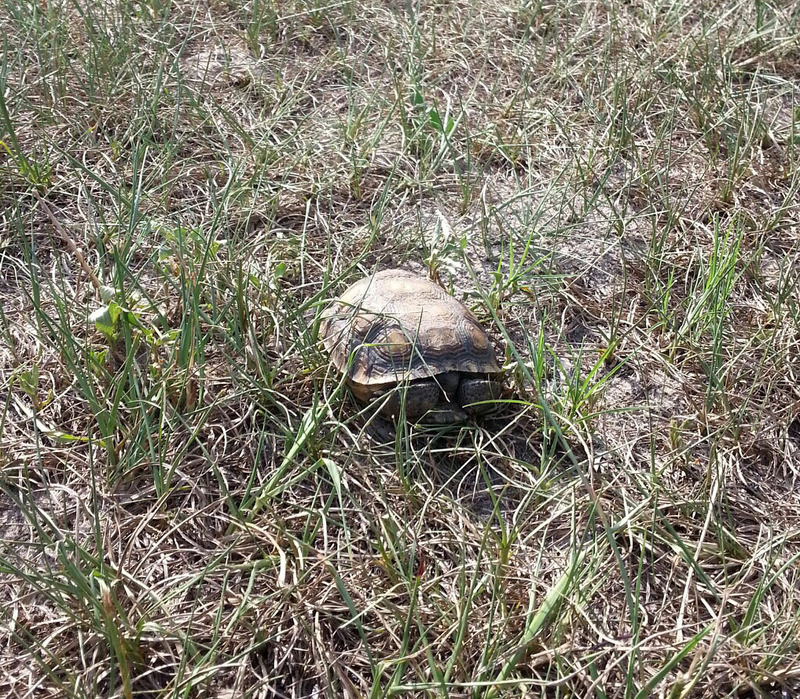 Youngest gopher tortoise I’ve seen yet. He/she may only be a few years old. The tortoises live near each other, and some of them must interact on a daily basis. I have not seen enough of them out at one time to really say just how they interact, but I imagine they may have some sort of hierarchy amongst themselves. They may also have individual preferences on which time of day to forage, like different work shifts. Males are known to visit the burrows of females during the months in which they mate, and generally, the ladies will let him know if they’re interested or not. Possibly a male visiting a female burrow just a few yards from his. For the most part, I believe Gophers live in a somewhat solitary state, even while living in a colony. I commented on the social interactions because there are tortoises who display some herding behavior, such as the Pancake Tortoise. In other cases, both in captivity and in the wild, other species have been observed to behave similarly either when kept with other animals or in wild settings. An awful lot of people give reptiles little credit for any intelligence, but they do have it. It’s just not what they’re expecting. I love going out and seeing these tortoises in the wild as they should be. They are charming, and though skittish, well worth the patience getting photos of. The best shot I’ve gotten of one of these tortoises, taken just recently.